The buying procedure in Cyprus is relatively straight forward but there are some differences from the UK despite what you may read on many other websites. You will need a Cypriot Solicitor to act for you as while the contract will be in English all the other official paperwork will be in Greek – such as the Title Deed the Searches, building permits etc. The main difference is that when the Developer builds a new project there will be a Title deed for the entire project and hence there is no separate deed for each unit until the relevant permits have been issued and the process will take many years before the separate deed is ready. The system is very complicated and bureaucratic and it can take about 18 months to get even the planning and building permits. When the houses are built then the developer needs to apply for a completion certificate and a division permit. When all of these papers are ready then the Developer can apply to the Land registry to get the separate Title Deeds issued and an AX file is opened. This process can take anything from 2-12 years! When you buy a new house or a resale without deeds it is important to make sure your Solicitor to get your sales contract stamped and lodged to the land registry to protect your rights under law (for Specific Performance purposes, Law cap 232 as amended by the laws 50/70, 96/72 and 51(1)/95) and then you are then deemed the Beneficial Owner of the property. However the Legal Owner is still the developer (as he is still the Title Deed holder) until the process of preparing the separate deed is completed and if he gets into financial difficultly or ceases to trade then there have been problems in getting the Title deeds transferred to the buyer. There are now various laws and procedures in place to protect buyers but given that we are in a buyer’s market there are plenty of good quality properties with the Separate Title deeds ready so if you are at all concerned the best way is to buy a resale with the Title deeds ready to transfer into your name on completion of sale making you the absolute owner of the property. Title deeds available– this means the paperwork for the transfer of separate deeds has been completed and a separate deed exists for the house in the name of the Legal owner which as mentioned earlier means the name of the Developer. The Developer will have advised the Beneficial Owner that the deeds are available but in many cases the buyer has either not chosen to transfer them to his/her name as are intending to sell thus saving the cost of the Transfer Fees or has been unable to get them transferred. The title deed needs to be clean to transfer the ownership – i.e. have no mortgages from the developer or any memos for unpaid taxes or if he has then he needs to arrange for payment of these to remove the encumbrance from the deed. This all takes time and can put off buyers unless they are prepared to wait. There is a new procedure in place from September 2015 to assist owners who find themselves trapped by a developer debt. 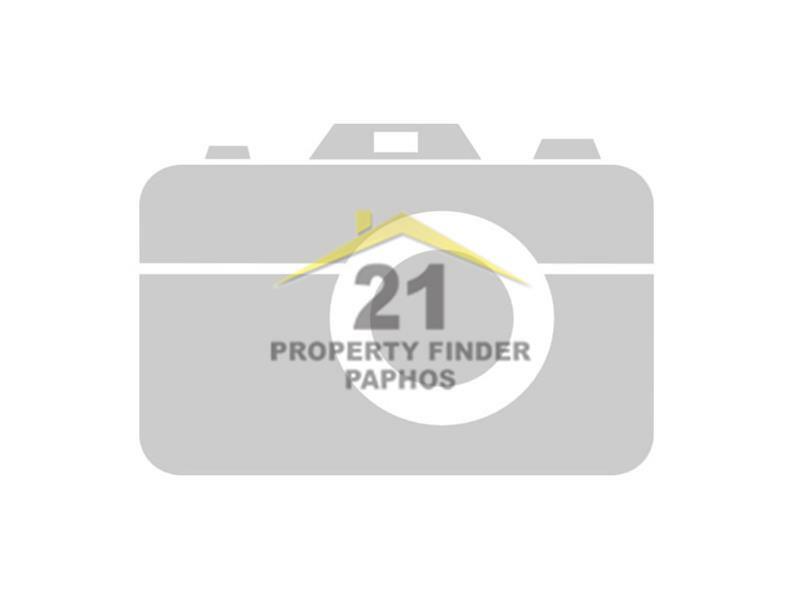 Full Title Deeds– means that the deeds for the property are in the name of the seller – and the property details are complete – that is they include the description of the property – e.g. a single storey dwelling, a swimming pool etc. So it is straight forward to buy this property. Land Title deeds– this means the seller bought a plot and had the deeds for the plot transferred to his name and has still to complete the updating of the deed – to a full deed as above. This may mean the house does not have a building permit yet or a completion certificate or it may mean that they have not applied to get the deeds updated or they have an AX file awaiting processing from the land registry. 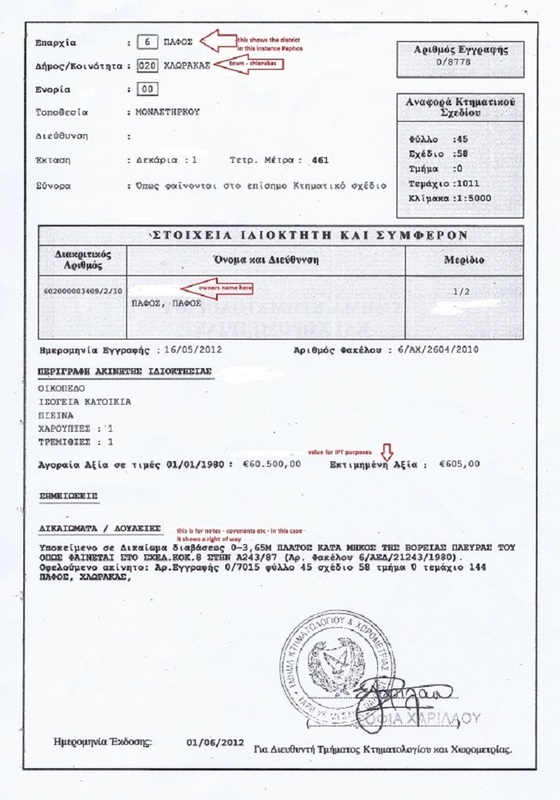 The title deed document as mentioned earlier is written in Greek so it is important to ask your solicitor to go through it with you to make sure you fully understand the content of the title deed – the front page is a descriptive document noting the sizes and the property details and description, the legal owners name. It will state the house type if there is a pool or not and any conditions of use e.g. if there is a right of way of covenants etc. just as in the UK. If there is more than one owner there is a separate title deed for each owner and their name and share of ownership is on the first page of the deed. If the property is in a complex with shared facilities it will show the % of the share of the common area that you own and you will be required to pay common expenses for the % that you own. The next part shows the maps of the development and the houses with the numbers of the plots which should correspond to the front page of the deed for the particular property. Your solicitor will check this but you need to go through this with them to fully understand what you are buying and that the title deed is correct. The first page of the deed also has the valuation of the property for Immovable Property Tax (IPT) purposes and this tax is payable once a year and is issued in Oct/November – the amount payable will be calculated for each owner according to his share of ownership. We of course do our due diligence when we list a property and will have a copy on file of the Title deed so we can explain it to you. This topic is widely misunderstood so to keep it simple to understand the best way is to call it by its official name – Transfer Fee /Tax. Basically this is a tax imposed by the Land Registry each and every time the property changes ownership. Bearing in mind the first buyer when he buys the property from new he is buying it from the Developer who holds the Title Deed for the entire project is classed as the Beneficial Owner so he is not required to pay the Transfer fee until the actual separate title deed is ready.If in the meantime he decides to sell he can assign his rights to the new buyer (with the seller paying an assignment fee to the Land Registry for this service) by way of an assignment contract and the new buyer then will pay the Transfer Tax when the separate Deeds are ready in order to have them Transferred into their names and then they become the legal owner.